After all the talk of the New York bike rack competition, this product falls into my inbox. A Danish design company has developed a bike rack that just may be perfect for the urban landscape in cities. True to the unwritten principles of Danish Design it is simple, elegant and practical. Holbech Design, in Denmark's second cycle city Odense, developed this standalone rack. 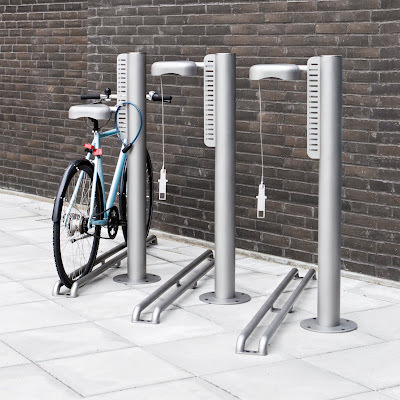 It is a fantastic new twist on providing secure, theftproof storage of bikes in public spaces. It is functional and flexible and made out of glass-blown, rust-free steel that has a lovely finish. Here's how it works... you slide your bike into the rails and then slide the metal seat cover firmly down onto your seat. The attached wire is run through the bike frame and through the slot on the post. Using your own lock, you secure the bike. You can't nick it and you can't even steal the wheels. Quite brilliant. This is something I could see on the streets of North American cities. Holbech Design has various suggestions as to placement of the racks on the streets. 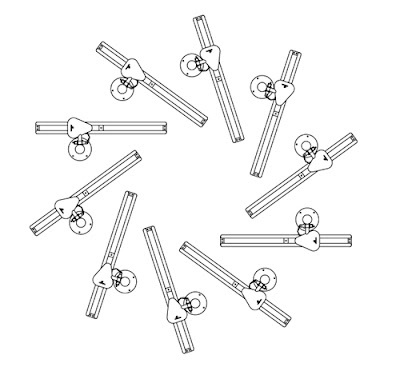 Above is a 10 bike solution. See the other ones on their website. So... what does the esteemed Copenhagenize panel - even the whiny, pessimistic ones :-) - think of this puppy? Would it work on the streets where you live? Do you like it? Does it live up to the requirements of a bike culture in your town? Should I order a few hundred for you and send the bill to your city hall? Meanwhile, back in Copenhagen, the new Concert House at Danish Broadcasting is getting ready to open and the bike racks have arrived. They just need to install them and then the show can go on. 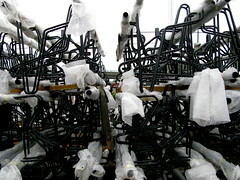 A lovely sight... hundreds and hundreds of bike racks, just waiting for bikes.